Everyone grows up cultivating various hobbies, interests, and lifestyles. Many of these can be practiced for a lifetime, but there are also many pursuits that require a capable body and youthful energy. Unfortunately, for many senior citizens, this means that many of their favorite things growing up are no longer an option. No matter how healthy you keep your body, age is an inevitability and eventually, it will start limiting your options. For elderly people who are in this position, it’s expedient that they find new ways to spend their time which aren’t so physically demanding. Did you know that board games are an excellent choice for this? Board games are not only fun and competitive, but they can also be done entirely sitting down, and many new games are also mentally stimulating in a way that can help to keep one’s mind sharp — something that’s especially important for people in an advanced age. Let’s look at some board games that are good fits for senior citizens. Let’s just get the most obvious candidate out of the way. Chess is considered by many to be the greatest and most balanced game ever created. For many people, Chess is not a game — it’s an art. While the average senior probably isn’t going to dive into the game like regional Chess grandmasters do, that doesn’t change the fact that it’s an incredible game for two people. Chess challenges your strategic and tactical sensibilities, is easy to set up and put away, and it’s easy to bring to the table since it only requires one other player. It’s hard to think of an argument against Chess, except for that it’s simply not your cup of tea. And if not? Good news — there are many other games that have appeal to senior citizens! Carcassonne is a game where you and your opponent take turns drawing tiles and placing them in a shared space. Each tile represents a tiny section of a medieval landscape, being comprised of either fields, castles, or roads. Every tile adds to the ever-growing landscape, and as the roads and castles grow, players can “claim” them with little tokens for points. Carcassonne is exceedingly simple and can be learned in less than five minutes, but it can be replayed time and time again, and every experience is different because the tiles paint a completely different picture every time. One game might result in a bunch of tiny castles all over the landscape, while another might have one massive fortress that ends up granting the victory. Every game of Carcassonne is different, but one thing is always the same — it’s a great time for everyone involved! Carcassonne also supports up to five players, making it a great choice for groups. There are doubtless many seniors who have grown up playing one of the most classic card games of all time — poker. One of the biggest appeals of poker is the bluffing aspect. Many would argue that poker is less about your hand, and more about how you’re playing your opponents. If this kind of thing appeals to you, you’d probably love Sheriff of Nottingham. Sheriff of Nottingham is a game that takes the bluffing aspect you love in poker and runs with it. The idea is, every turn, one person acts as the “Sheriff of Nottingham.” The other players have cards in their hands that represent various “goods,” and they have to put some in an envelope and hand them to the sheriff. They tell the sheriff what goods are in their envelope, and how many. The sheriff then has the option of checking their envelopes, and this is the important part — if the player is telling the truth about what’s inside, the sheriff is penalized. If they’re lying, the player has to pay a fee. However, if you put more in your packet than you declared and you get away with it, you’ll get more money. So, it’s a game about deciding whether or not to bluff, and if you’re the sheriff, calling people on their bluffs. A great game for those who love poker without the betting aspects! At Wilson Care, our mission is providing quality home care services to the seniors in Honolulu who are in need of it. Our caregivers provide many essential services that lighten the burdens which many elderly people have to deal with on a daily basis. 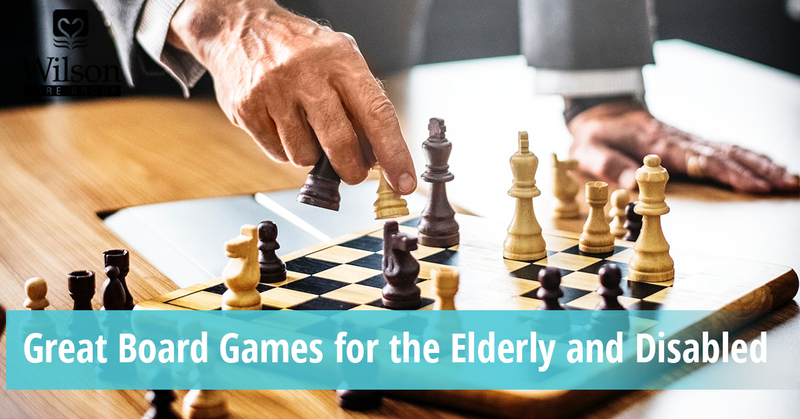 We’re always looking for ways to improve the lives of the senior citizens whom we serve, and for certain people, board games can be a great way to do that! Are you a senior citizen who is contemplating the need for home care services, or someone who’s looking for a caregiver job? Contact Wilson Care today! PRICING & PROGRAM INFOPlus, Schedule A Free Consultation.